Welcome to New Threshold Theatre. Please, explore. ​in Arkansas by New Threshold Theatre. 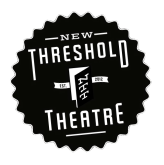 New Threshold Theatre closed in May of 2015 after producing three seasons of work. ​Check out some of NTT's best moments!